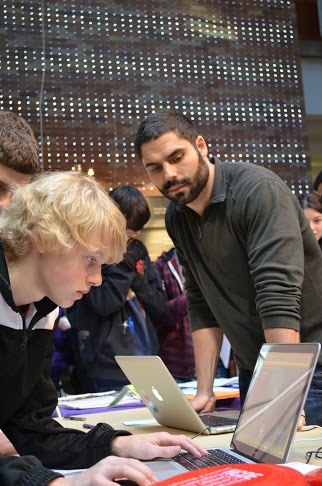 PhD student Daniel Perry looks on as students play the game MAX5 at the Computing Open House. UW students Megan Torkildson (undergraduate student) and Daniel Perry (PhD student) represented the HCDE Department at UW’s Computing Open House this past Saturday, an event that drew over 1,000 middle and high school students and their families to explore and learn about computing activities on campus. Torkildson and Perry were among the HCDE volunteers at a table that featured an interactive iPad activity as well as the bioinformatics game, MAX5, developed by Perry and members of the Games for Good Research Group. “Many of the students we spoke with were pretty excited about the game, especially the ones interested in computing as well as film production, art, or game animation. They didn’t know a department like ours existed where they could easily combine these interests” remarked Perry. The annual event was sponsored by Amazon, Google, and Microsoft, and featured dozens of projects in computing related fields.